Ready for your own Piece of Paradise in the Aska Adventure Area!? 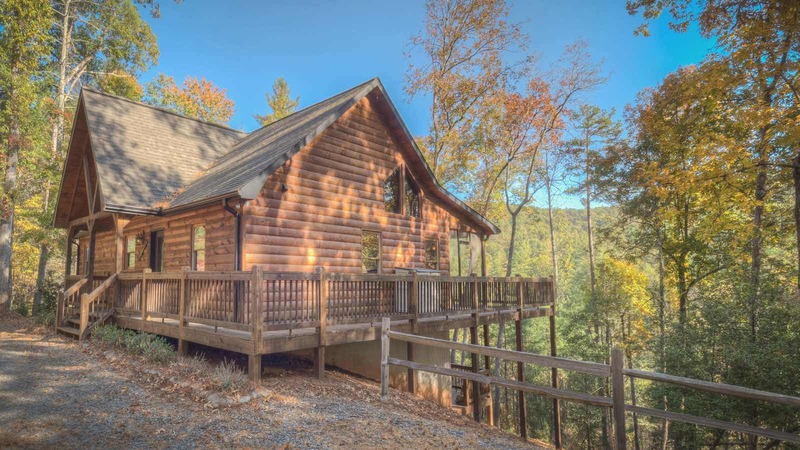 Here is a lovely, unique cabin located in the Aska area of Blue Ridge, minutes from the Toccoa River, hiking trails, and only a 20-minute drive (approx. 8 miles) from Downtown Blue Ridge. 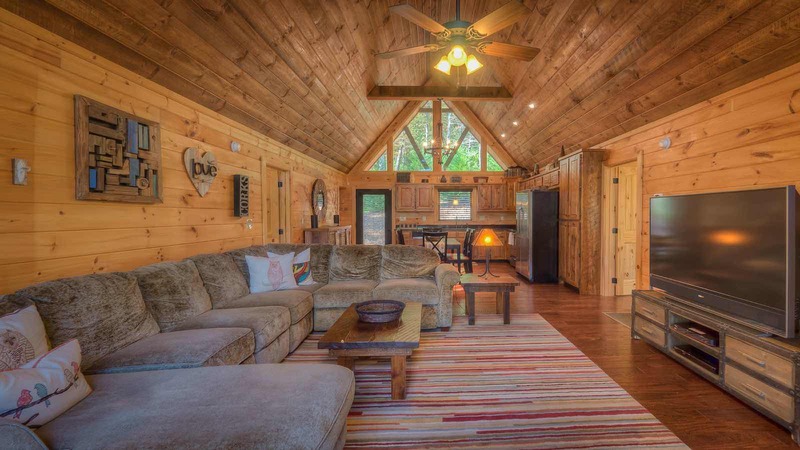 This beautifully built cabin has a vast array of specially designed lumber products and as well as many beautiful decorative touches through out the whole property. 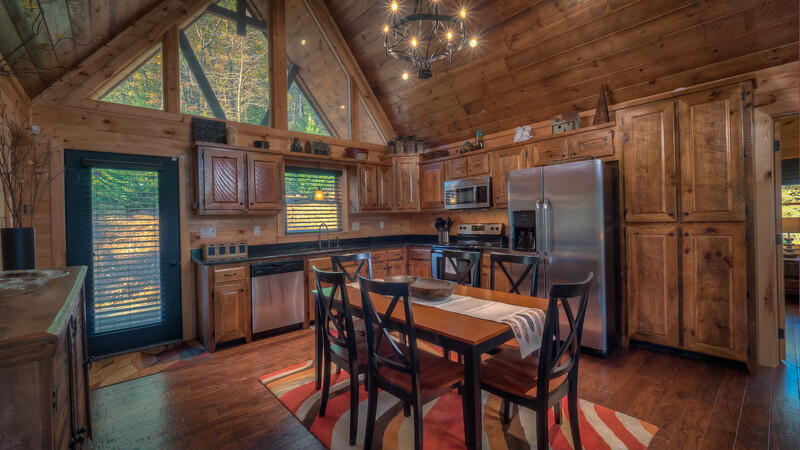 You’ll note many interesting wood and stone textures contrasting and complimenting each other as you explore the cabin. 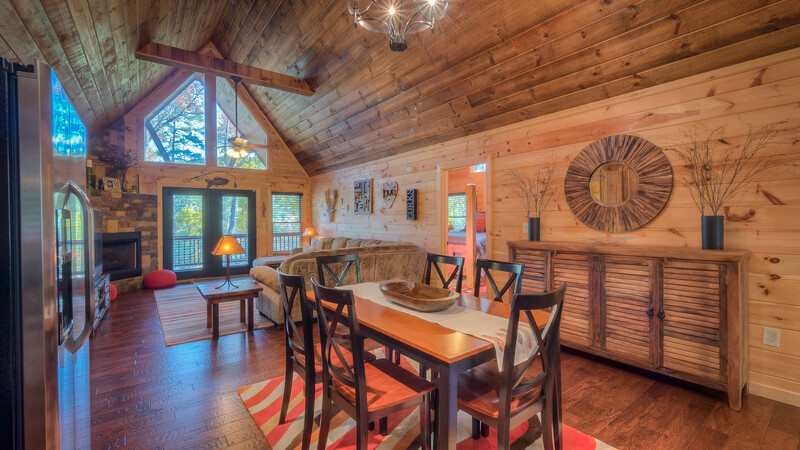 Once you see the details in person you’ll find yourself imagining just how luxuriously this cabin was crafted by the builder and his team. Enter the main level of Piece of Paradise to the open concept kitchen and great room with large glass windows facing the mountain view. This kitchen has granite countertops, custom build “rough-sawn” cabinetry, a dining table for 6 people, stainless steel appliances and the living room has cozy seating around a flat screen TV and stone gas log fireplace. This level has two bedrooms, one on each side of the living room. 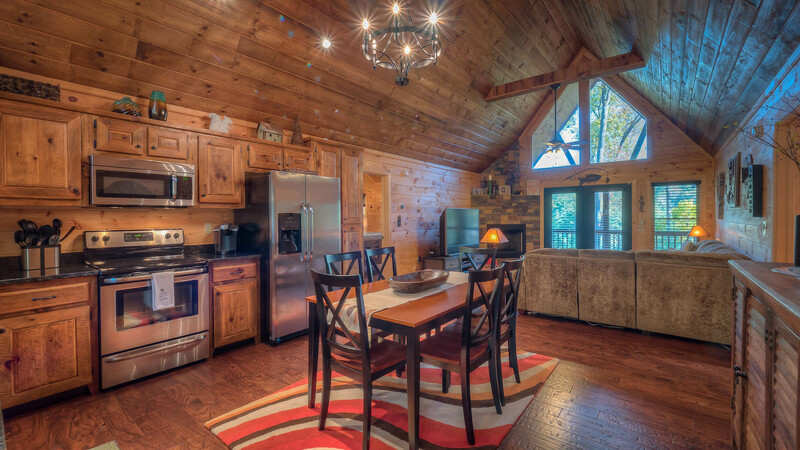 Both bedrooms have king size locally handcrafted beds, large windows, and both have a TV in each room. One bedroom has double copper sink vanities on a gorgeous log slab, a jetted garden tub and tile shower. The other bedroom has a standard tub/shower combo with a single copper sink vanity on an another gorgeous log slab. Both bedrooms have doors to access the main level deck. The main level deck has seating perfect for enjoying your morning coffee while overlooking the mountains. Downstairs you’ll find the game room level and third bedroom. This level has a flat screen TV with seating and a pool table for hours of entertainment and enjoying your guests! 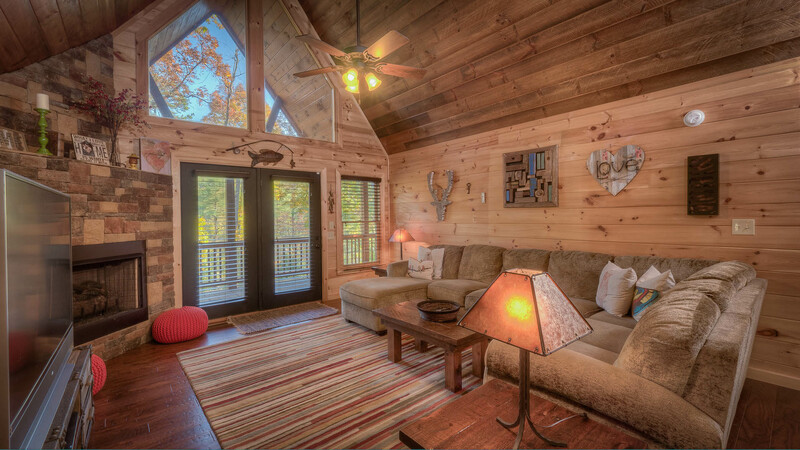 You will also find the third bedroom, which has a barnwood-style Queen size bed and TV. The bathroom here has a large log slab with a single copper sink vanity and standard tub/shower combo. Outside is the relaxing hot tub! Soak your stress away with the bubbles and warm water as you look out over the mountains and trees. This quiet area is wonderful for enjoying the view and stars as the sun goes down. Book your getaway now and claim YOUR Piece of Paradise!